On the morning of Sept. 27, students across America and the globe lifted their voices in prayer, just as students before them have done in observance of previous events since 1990, known as See You At The Pole (SYATP). 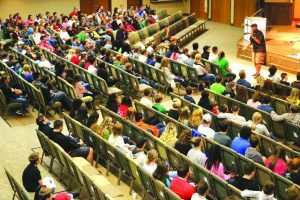 Students across Oklahoma gathered alongside their peers to observe prayer and build community. In Sayre, approximately 65 students met despite weather complications. At Empire Public Schools in Duncan, approximately 100 students, parents and staff members listened as Rowdy Swanson, a student, talked about fixing eyes on Jesus, using the illustration of Peter walking on water in Matthew 14. Duncan, Fair provided breakfast. Dickson students gather around the basketball court at their school. 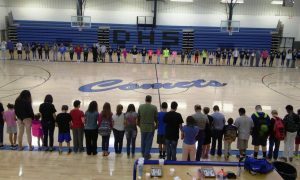 In Henryetta, more than 70 high school and middle school groups joined together in prayer for their school, community and nation. Other schools reported observing SYATP to the Messenger include: Ardmore, Bethel, Capitol Hill, Chickasha, Cheyenne, Crossings Christian, Dickson, Lane, McAlester, Noble, Norman North, Tishomingo, Sand Springs, Warner and more. 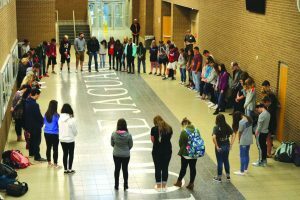 Westmoore High School in Moore hosted a See You At The Pole event where students began by lifting their voices in worship and praise to the Lord, in the gymnasium lobby, rather than gathered around the school flagpole, due to rainfall on the morning of SYATP. “The devil and the weather were working against us today,” said Deanna Ragsdale, a high school staff member that attended SYAPT. Ragsdale and Deanne Pence, volleyball coach at Westmoore, volunteer their time to help lead the Fellowship of Christian Athletes (FCA) club, Ragsdale as a character coach and Pence a coach. For those unfamiliar with the event, See You At The Pole began when, on a Saturday night in Burleson, Texas, a small group of teenagers felt compelled to pray, according to syatp.com. The students were burdened for their friends and vulnerable before God as they visited three different schools in their town. At each school, they gathered around the flagpole and prayed for their friends, schools and leaders. The students who acted in obedience in 1990 may have been naïve to the movement that would soon sweep the nation and eventually the world. The prayer movement quickly spread to surrounding communities and youth leaders, and a vision in the hearts of youth leaders began. On Sept. 12, 1990, more than 45,000 teenagers in four different states met at school flagpoles for the first ever See You At The Pole. The following year, on Sept. 11, 1991, an estimated one million students gathered around flagpoles across America. Now, 25 years later, See You At The Pole is a day committed to global unity in Christ and prayer for a generation that is a part of the Global Week of Student Prayer, Sept. 24-Sept. 30. The Global Week of Student Prayer encourages students to find new and unique ways, places and times to pray throughout the week. It is dedicated to prayer and launching organizations like on-campus Bible studies, prayer strategies and other student ministries. Westmoore students gather in the gym lobby. Young began preparing Moore, First students for SYATP one month prior to the event. Students were given life books and encouraged to pray for the person God laid on their hearts to invite to the See You After The Pole rally, held at Oklahoma City, Brookwood. 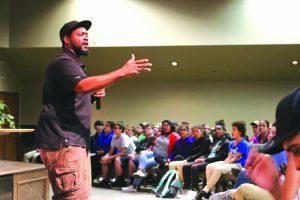 “The main goal was to pray for that person, invest in that person’s life and then invite them to come to the rally and have a chance to engage in Gospel conversation,” said Young. The SYATP rallies are a time of fellowship in which churches from regions and associations come together for fun, fellowship and a powerful time of worship and Gospel presentation the evening of the SYATP observance. Summit OK Collective led worship at the rally, and Vince Carter spoke about his football career, relating it to being active participants in relationships with Christ, but not truly knowing the Word. Carter is a former All-American offensive lineman at the University of Oklahoma who then moved on to the National Football League (NFL). He is now the southwest Oklahoma area representative for Oklahoma FCA. 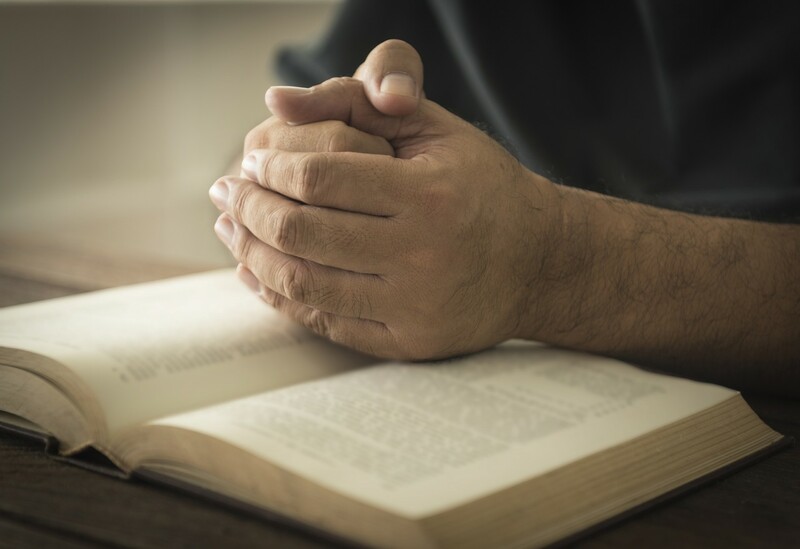 Speaking from Romans 3, Carter told of a time in his life where he regularly memorized scripture but did not truly know or fully comprehend the Bible. 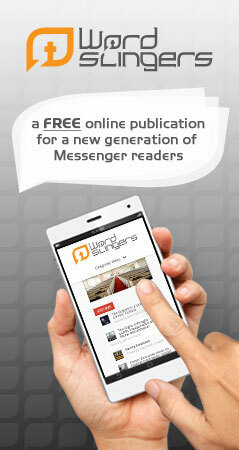 Together, Carter and his cousin read through Scripture, gaining knowledge and understanding of the Lord’s Word. Vince Carter speaks to students at Oklahoma City, Brookwood at the south Oklahoma City SYATP Rally. Many students responded to Carter’s message. Youth leaders from the churches represented at the rally waited at the altar as students came forward to pray and make decisions to follow Jesus. Because a group of students stepped out in obedience and faith, some 25 years ago in a small Texas town, youth across the nation have made professions of faith in Christ and the door to an eternity in Heaven opened. As students led prayer at schools across the country on a rainy September morning, steps were taken towards a bright future filled with a generation rising up to take their place in the Kingdom’s work beginning with prayer. Students attend a SYATP Rally at Oklahoma City, Brookwood. Funding for SYATP rallies in Oklahoma is provided through the Edna McMillen State Missions Offering.